The SPRm200 system opens a new frontier in the study of molecular interactions by integrating optical microscopy with Surface Plasmon Resonance (SPR) technology. Designed especially for in-vitro, label free measurement of binding activity and cell kinetics, SPRm 200 provides a spatial visualization of cellular structures together with local binding activities. Thus, real-time interactions of the drug and membrane protein can be measured in its native state without needing to extract proteins from the cell. 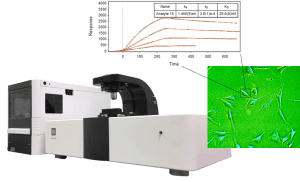 With its outstanding sensitivity and stability, SPRm 200 also allows for the measurement of nanometer scale binding activities, the study of bacteria and virus interactions with antimicrobial drugs, and the development of new methods for nanoparticle drug delivery. The Surface Plasmon Resonance Microscopy (SPRM) system, integrates optical microscopy and SPR, is a powerful technique for measuring binding activities of membrane proteins in vitro. It allows the simultaneous measurement of phenotypical changes of the sample via bright field and binding strength and kinetics via SPR. Integrated optical microscopy with SPR Bright-field and SPR microscopies in one instrument. Large field of view with high resolution optics to view single or multiple cells. In vitro and label-free binding activities mapping Provides SPR sensorgrams and binding activity map of individual cells as well as the binding kinetic constants (ka, kd, KD). Nanometer scaled binding response of virus, bacteria and nanoparticles Nanomotion detection study of bacteria or virus metabolic activity or binding activities of nanoparticles for drug delivery designs.